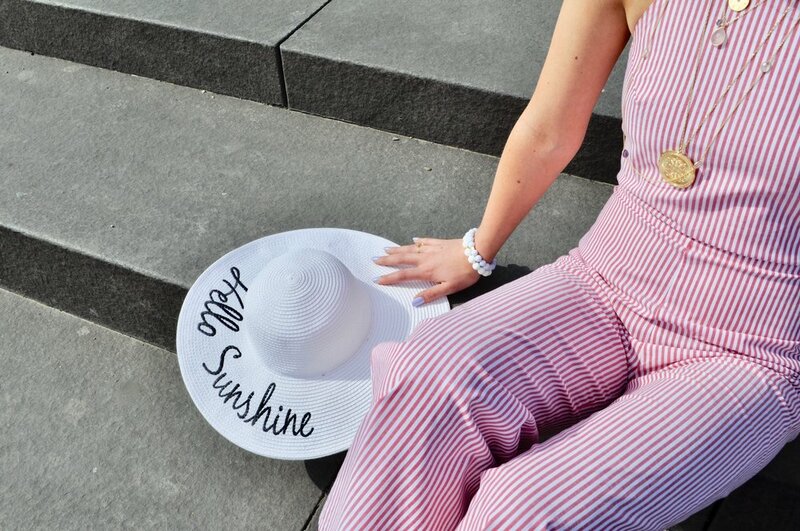 Jumpsuits come in many different styles, so finding one that flatters your body type is easier than ever. They are totally worth the hassle in the bathroom because they look so cute. You know, if someone could come up with a bathroom friendly jumpsuit, that would be cool… (looking at you Aritzia). They make you look long and lean and waistlines are usually accentuated with a built in belt or elastic to give a well defined look. Layered necklaces are our favourite way to style a jumpsuit! Delicate necklaces look amazing with patterned jumpsuits and by stacking them you can accessorize without overpowering. We also like to pair bracelets with jumpsuits to complement the necklaces that you have chosen as well as the outfit. Is your jumpsuit too extra for necklaces? If you have too much going on for a necklace you can add a pair of statement earrings! A great pair of hoops or adding some colour can be just whats needed for a little extra pop! However you choose to style your jumpsuit, we know you will rock it. Side note! : Did you know a romper is shorts, a jumpsuit/playsuit has full legs! Fun facts I learned!